How important is the publisher version of the article to researchers? In the past, when articles were largely only available in print, it was safe to assume that most researchers were accessing the publisher’s version. If readers wanted to double check that, getting hold of the author’s manuscript would take much longer than it does nowadays (i.e. finding the contact details for the author, writing to them, waiting for a response). However now that articles are available online in multiple formats (author manuscript, pre-print servers, subject repositories) it is reasonable to question how many researchers still want to access the final publisher version and, in addition, whether they are confident they can distinguish between different versions. 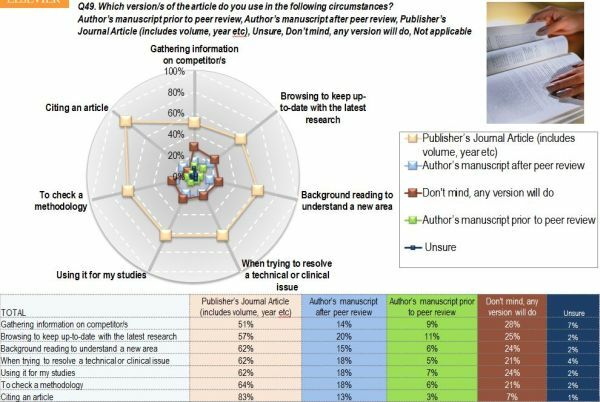 In a recent researcher study carried out by Elsevier’s Research and Academic Relations team, it was found that the majority of researchers wanted to access the publisher’s final version, i.e. the official version that included the volume and year. This was particularly the case when researchers were citing an article (83% indicated they would want the final publisher version for this activity). However, when researchers were undertaking other activities, i.e. those not related to authoring such as general browsing, they were less concerned about the publisher’s version. For example, when browsing to keep up-to-date only 57% wanted to access the final version, 20% were happy with the author’s manuscript after peer review, 11% the pre-reviewed manuscript, with 25% saying that the version did not matter (note that respondents could select more than one option). Given the importance of accessing the final version in specific situations, it might be expected that researchers would be confident they could identify the final version. When asked how confident they were, only 58% were confident.There was variation across subject areas. Mathematicians, life scientists and earth/environmental scientists were most confident they could distinguish between different versions. Least confident were computer scientists and those in medicine & allied health. Computer scientists are less concerned about the version being used so it makes sense that they would be less likely to distinguish between versions, whereas in contrast medical researchers are more likely to want the final version, so not being able to tell is a greater issue for them. These results suggest that publishers and importantly, repository managers, are not making it explicitly clear to researchers which version the researcher is accessing.